the key to battling herbicide resistant weeds (or any weeds, really) is to use a diverse weed management program. How diverse are US herbicide programs? To determine the answer to this question, and whether herbicide diversity has increased or decreased over time, we first need to quantify diversity. As you might imagine, diversity isn’t a simple thing to measure. Ecologists commonly use a measure called the Shannon diversity index, which has a rather fascinating origin completely unrelated to ecology (the Shannon diversity index was originally developed to measure entropy within the context of information theory). Without getting into too much detail, the Shannon diversity index (commonly noted by the capital letter H) has a rather intuitive interpretation: higher H values mean greater diversity. But simply looking at herbicide diversity would be very misleading with respect to herbicide resistance development. There are at least 16 different herbicide active ingredients used in corn or soybean that have the same site of action (SOA). If weeds evolve resistance to any one of these herbicides, it is likely that the weed will be resistant to all 16 of them. So with respect to herbicide resistance, we are actually interested in site of action diversity. To calculate site of action diversity, I downloaded herbicide application data for six different crops and categorized each herbicide in the data by site of action. The Weed Science Society of America (WSSA) assigns group numbers for each herbicide site of action, and I’ve used those SOA group numbers in the figures below. Each figure below (click to see a bigger version) shows two things: in the left panel is the proportion of total acre-treatments for each herbicide site of action, and on the right is the site of action diversity estimate for the same time period. An acre-treatment is the average number of applications of a given site of action to each acre. For example, if 1 acre received aplications of 2,4-D (Group 4), dicamba (Group 4), and glyphosate (Group 9), that would equal three acre-treatments (two of Group 4 + one of Group 9). Similarly, if an acre received only two applications of glyphosate and nothing else, it would have received two acre-treatments of a Group 9 herbicide. The site of action diversity (right side of each figure) is the H value calculated for the herbicide use for each year. 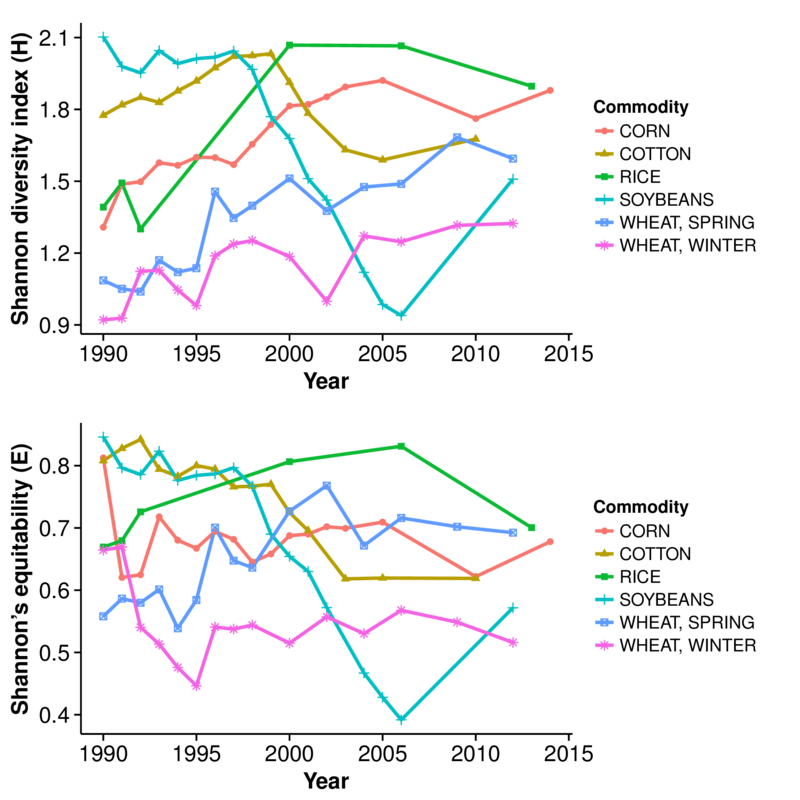 A loess regression line was fit to the diversity data to illustrate trends over time. Herbicide site of action diversity in soybean declined significantly beginning in 1999 and continued a downward trend until 2006. This reduction in herbicide diversity corresponded to heavy use of glyphosate in glyphosate-resistant (Roundup Ready) soybean. USDA did not collect herbicide use data for soybean again until 2012, when herbicide diversity had increased to similar levels as observed in 2001, when glyphosate resistant varieties were planted on 68% of US soybean acres. 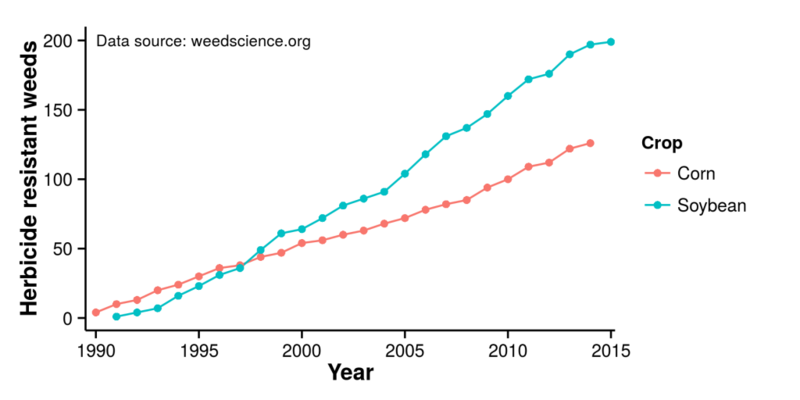 It is possible that herbicide resistant weeds were responsible for the increase in herbicide diversity between 2006 and 2012. Herbicide site of action diversity in cotton showed a similar trend as soybean, although the reduction in conjunction with glyphosate resistant crops was not as drastic. Of note is the significant reduction in Group 17 herbicides, which are the organic arsenical herbicides MSMA and DSMA. All arsenical herbicide registrations were cancelled as of 2009. [UPDATE: MSMA still has an active registration.] It is difficult to argue that reduction in these herbicides was a bad thing. Because, you know, arsenic. Glyphosate resistant corn was introduced around the same time as soybean and cotton. However, the adoption rate of glyphosate resistant corn varieties was much slower than those other crops, in part, because of the many effective herbicides available for use in corn. The net effect of adding glyphosate to a crop with many existing effective herbicides was an increase in herbicide site of action diversity. Introduction of the Group 27 herbicides (HPPD – pigment inhibitors) during the same time period also contributed to the increase in diversity. This reduced a rather heavy reliance on Group 5 herbicides (such as atrazine) and Group 15 herbicides, thereby increasing overall herbicide site of action diversity in corn. The corn data illustrates why it is ill-advised to generalize about the effect of herbicide resistant crops or GMO crops on herbicide use patterns, at least with respect to selection of herbicide-resistant weeds. Certainly, the adoption of glyphosate-resistant crops has consistently increased use of glyphosate. However, the impact of that change on herbicide diversity differed by crop. In corn, the Roundup Ready system resulted in a diversification of herbicide sites of action, which would be expected to decrease selection for herbicide resistant weeds. Rice acres were only surveyed six times over the last 25 years. A linear regression was used for rice SOA diversity since loess would have ‘overfit’ the data with this few data points. The surveys were conducted near the beginning and end of the period, though, so we can still be reasonably confident in the overall trend in herbicide diversity. In the early 1990’s, only two herbicide groups (Group 8 and Group 7) made up around 75% of all herbicide applications in rice. Group 2 herbicides increased steadily over the last 25 years, at least in part, due to adoption of Clearfield varieties, which were bred to be resistant to the imidazolinone (Group 2) herbicides. The increase in Group 2 herbicides in rice is similar to the increase in Group 9 herbicide (glyphosate) in corn. Herbicide diversity has steadily increased in spring wheat. In the early 1990’s nearly 75% of herbicides applied were Group 4, which includes the synthetic auxin herbicides 2,4-D, MCPA, and dicamba. 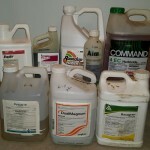 Over time, reliance on that group of herbicides has declined, being largely replaced by Group 6 and Group 9 herbicides. Glyphosate is the only Group 9 herbicide, and its use has increased steadily over the last 25 years, even though no glyphosate-resistant spring wheat varieties are grown commercially. Since glyphosate cannot be used in the growing wheat crop, the Group 9 herbicide use shown in the figure must be applied before wheat planting. The same trend in glyphosate use has been observed in winter wheat. Reliance on Group 4 (auxin) herbicides in winter wheat has remained relatively steady over time, but reliance on ALS inhibiting herbicides (Group 2) has declined slightly. There has been a subtle increase in site of action diversity in winter wheat over time, again, in large part due to increased use of glyphosate. Another way to quantify diversity is to look at ‘evenness’ of the herbicide use. Shannon’s equitibility (abbreviated E) is a measure that estimates evenness. Shannon’s equitibility also has a reasonably intuitive interpretation; if all herbicide sites of action were used on exactly the same number of acres, E would approach the value of 1.0. If a single herbicide makes up a vast majority of the herbicide applications, E will be much lower. To compare crops with respect to herbicide site of action diversity, I’ve placed the diversity indices and evenness estimates over time on the same plot. In 1990, soybean had the most diverse herbicide program by either statistic, but dropped to be the least diverse herbicide program by 2006. Rice and corn both started out in the middle of the pack with respect to site of action diversity, but then increased to become among the most diverse. Increases in both of these crops is at least in part due to herbicide-resistant varieties (Roundup Ready for corn, Clearfield for rice). Cotton, another herbicide-resistant crop, had an intermediate response. Again, it is important to remember that reliance on herbicides to solve herbicide resistance isn’t a winning proposition in the long-term. But increasing herbicide site of action diversity is generally agreed to be one important component for herbicide resistant weed management. If we agree that herbicide resistant weeds are a problem, and that we’d like to continue using herbicides for the foreseeable future, then the increased herbicide diversity observed in corn, rice, and wheat should probably be considered, on balance, a good thing. But it is important to note a few deficiencies in this data. These national level trends are not necessarily representative of the herbicide selection pressure being applied to a given weed species in a given area. To be effective with herbicide mixtures, both herbicides must be effective on the target weed. Mixtures of Group 1 herbicides (which control only grass weeds) and Group 4 herbicides (which control only broadleaf weeds) will not be effective at preventing herbicide resistant weeds. The diversity indices here do not account for ineffective herbicide mixtures. Also, national level trends may not reflect what is being applied in a particular county in Iowa or Arkansas or Wyoming. On a localized basis, far fewer herbicide sites of action might be used. Finally, herbicide diversity may be increasing in response to increased problems with herbicide resistant weeds, which would mean herbicide diversity is less effective, although that cannot be determined from this data set. Even with these caveats, the diversity data suggests that herbicide resistance traits (either through biotechnology or conventional breeding methods) can either increase or decrease herbicide diversity depending on how they are used. These data don’t support the claim that herbicide resistant crops, as a whole, have made the weed resistance problem worse (or better). The cases of glyphosate resistant soybean and corn are interesting examples in this regard. Soybean had the most diversity in herbicide sites of action in 1990, while corn had among the lowest. The introduction of Roundup Ready varieties caused herbicide diversity to drop drastically in soybean, but steadily increased herbicide diversity in corn. The rate of resistant weed development over the same time period has been significantly greater in soybean compared to corn (see figure below). Causality cannot be established here, but this is the trend we would expect based on the herbicide diversity observed in these two crops. Glyphosate seemed to supplement alternative herbicides in corn rather than replace them, as occurred in soybean. Presumably, those alternative soybean herbicides were still available, but they were not being used. Herbicide resistant crops provide an additional tool for farmers to use. Whether or not that tool is used to effectively combat herbicide resistance or exacerbate the problem depends on many other factors. Economics, crop rotations, previous experiences, weed spectrum, etc. all play a major role in how farmers select and use herbicides. My guess is the reason other soybean (and cotton) herbicides didn’t see continued use after the introduction of glyphosate resistant varieties was that glyphosate was simply a much better herbicide. In contrast, there were many other effective herbicide options available in corn. Herbicide resistant crops are often used as a scapegoat for the problem of herbicide resistant weeds. But these data suggest the impact of herbicide resistant crops have resulted in very different use patterns, both positive and negative, with respect to herbicide resistant weed evolution. If we’re serious about increasing herbicide diversity, then farmers need more effective tools, not less. But we need to do a better job of using them appropriately.